The sublime to the ridiculous? Porsche values puzzle me. Everyone knows that if you buy a new car, even a Porsche, you immediately lose a bundle in depreciation, yet apparently new GT3’s are bucking this golden rule. There have always been collectable Porsche icons worth a lot of money, but lately these have gone stratospheric, 2.7 911 RS’s being an obvious example. Pre ‘73 911’s are now hugely valuable, and the trend is spreading to the more common SC’s and 3.2’s too. Yet the first water cooled 911’s (the 996) are languishing in the bargain basement, with the 997 looking like it might head the same way, despite these being superb cars. Transaxle cars are still all but off the radar. Like I said, puzzled. I rather fancied a classic Porsche to go with my modern Cayman, but looking at old 911’s it was obvious that boat had sailed without me, and good cars were totally out of my financial reach. To cut a long story short, I came upon a 924 for sale locally. All but a barn find, it was languishing in a garage a bit scruffy and unused, yet it had a great history and low miles. On a whim I bought it, (story here) and after a lot of TLC and some money spent, I have a delightful little retro Porsche. It is a hoot to drive, and I am amazed at how much Porsche I acquired for so little money, but more of this anon. I keep wondering how my pocket money classic would stand up to one of the real heavyweights. Out of the blue came the chance to spend some time with the Porsche Club’s magnificent (and very valuable) 356. This gave me the idea for perhaps the most unlikely road test comparison you are ever likely to read; 356 v 924! David v Goliath, the Alfa and Omega of classic Porsches viewed through a dispassionate eye! My time with the 356 could not have started more badly. It was handed over to me, in an unfamiliar busy hotel car park, in the teeth of a howling monsoon, with darkness rapidly falling. The windows were misted over, the car was as alien to me as the Tardis, and I faced a 50 mile journey home before I could tuck it away safely for the night. Mindful of the value of what had been entrusted to me, my stress levels were off the scale for the first few miles. As I neared home on familiar roads, the traffic thinned, the rain eased up a bit, and I had my first glimpse into why these cars are so revered. This is a totally mechanical car. There are a few fuses and relays but that’s a far as it goes electronically. There is no power assistance for anything. It has drum brakes all round, the controls are not heavy, but they have a feel that is a mile away from a modern car. The gate on the gearchange is huge, but precise with it. The engine thrums away behind you, not fast, but not slow either, and the whole thing feels a little like you are piloting a big, precise clockwork mouse. Above all, you have to use some driving skill to make it all work, anticipating your braking well in advance. It was like stepping back in time; one of those light bulb moments. The deal was this. 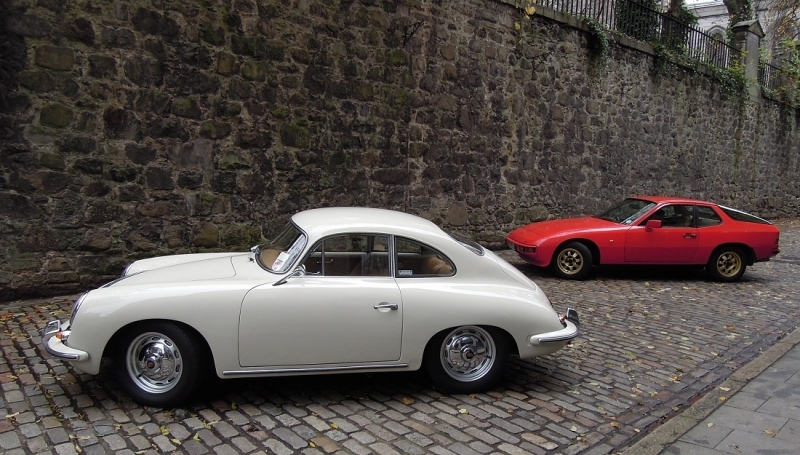 The 356 was doing the rounds of the Scottish dealerships. 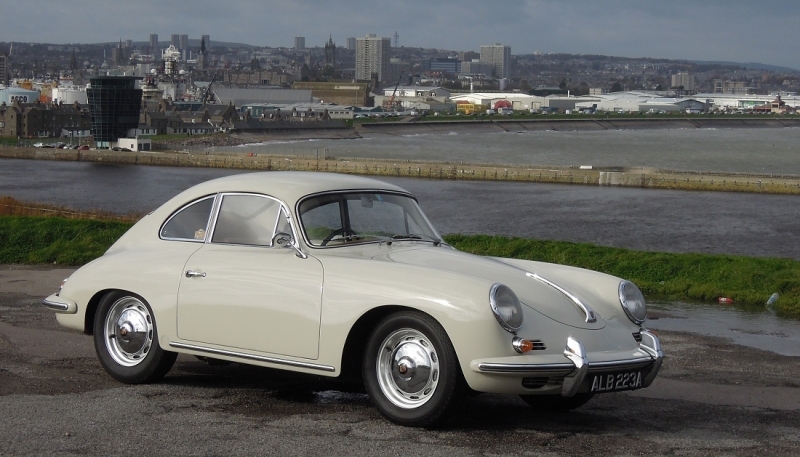 From Aberdeen it had to be transported to Glasgow, via a Porsche Club weekend in Ullapool. 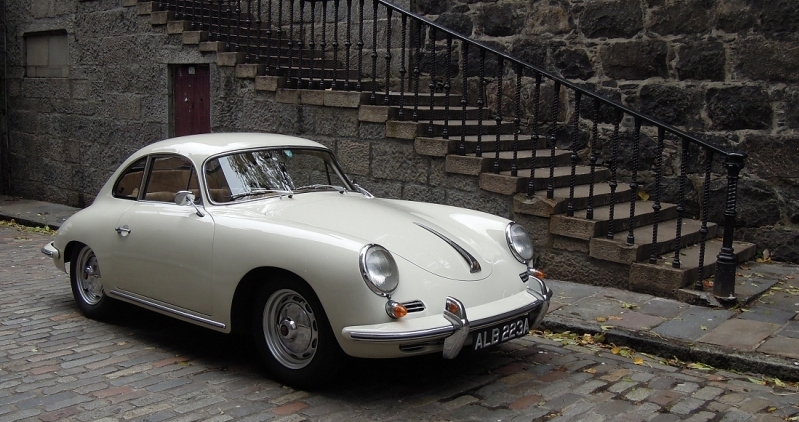 I volunteered to do some of the donkey work and deliver it to Glasgow, in return I was granted a morning with it to drive it alone and write about it for Porsche Post, the club magazine. Which is how I came to have two of the most blissful hours driving in years. 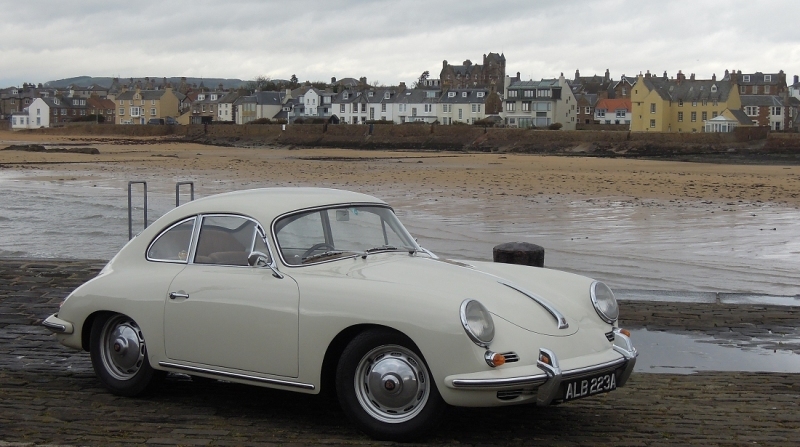 A cool grey Monday in October, the back roads of the East Neuk of Fife all to myself, and a 54 year old Porsche. Life should be so good more often! On roads like these, away from the traffic and the motorways, the 356 is just sublime. Let’s be frank, it is not a fast car, it would never see which way a Golf GTi went, but that matters not a jot. It FEELS brisk, eager and willing, and that’s what counts, because that’s what triggers all those messages through the tips of your fingers and the seat of your pants. I didn’t trouble any of our speed limits that morning, but I enjoyed my drive more than if you had given me a new GT3. I took some pictures at the harbour in Elie, and then sauntered home by the back roads through Ceres, by now completely in tune with the feel of the car. The large thin rim of the bakelite steering wheel felt so vintage, the stubby mechanical little push/pull switches so precise, the pliancy of the car on the road reminding me of how sports cars used to feel before the obsession with track testing made them all brick hard. Two hours on damp roads was nowhere near enough to fully plumb the depths of this extraordinary little car, but it was enough. I had got the feel, I understood what it was about, I’d like more, but I had my answer. A tattooed guy in a restored Mk3 Cortina gave me a flash of the headlights, a smile and a big thumbs up. That just summed up my morning to perfection! I had a bit of a rude awakening that afternoon though, when I delivered the car cross country to Glasgow. The first half of the journey was delightful, but when I hit the Glasgow motorways the heavens opened with a hurricane force downpour. The traffic was aggressive, the ventilation on the 356 is poor so the windows steam up, the wipers are only just adequate, and the car simply doesn’t have the punch to zip in and out of the traffic. The car felt every one of its 54 years, well out of its comfort zone, as was its driver. To its credit, it delivered me safe and sound to Porsche Glasgow, but it was not a fun journey. You could use a 356 as a daily driver, but you’d need to be a bit of a masochist in my view. A rich masochist too, as I was constantly aware of the cars value, while another white van went blasting past in the spray. The previous week, Porsche Aberdeen had kindly agreed to let me remove it from their display for a morning to take some photos for the magazine. I had roped in Kevin Emslie, local press photographer and serial petrolhead to take some pro quality shots, and Steve Rose from the club was on hand as driver, gopher and best boy for the shoot. Please admire the pictures, because you have no comprehension of how utterly, bone-chillingly cold it was while taking them. What amazed me though, as we touted the 356 to various locations around the Granite City, was the sheer amount of attention it generated. Heads turned in the traffic, people would appear with camera phones wanting selfies with it, folk would ask what it was, and of course inevitably get in Kevin’s way while he was trying to shoot. I couldn’t help but notice too that most of these people were women! The 356 is an utterly delightful design, but it clearly has some sort of feminine edge to it that attracts the ladies. I’m not being sexist here either, it’s just a fact. Porsche might want to take note for future design direction! I had gone to Aberdeen in the 924, a 200 mile round trip, and as ever it shrugged it off as casually as if it was a modern car. Bear in mind my 924 is 33 years old, yet it can still whistle along a motorway ahead of the traffic. Twenty years separate the 356 from the 924, and they are most apparent at speed on the open road, where the 924 is more at home with modern traffic speeds. The 924 is also a very mechanical car, again with no electronics, the last car Porsche built before ECU’s started their relentless march. It also shares the same unassisted feel at the controls, and has that same loping way of travelling as the 356. Again it is compliant where modern cars are stiff and heavily damped. There may be a huge discrepancy in the technology between them, but drive them back to back and you might be surprised how similar they feel, they both have that almost indescribable "Porsche" feel. It all comes down to tactile, mechanical feedback. To understand the 924 you have to forget about it as a sports car, as it isn’t really powerful enough, the steering is a bit slow and the car is set up rather too softly. If you want a cheap little sports car, buy an MX5. Consider the 924 as a miniature GT car though, and it all comes together. Without the rear spoiler on the big glass hatch, it even looks like a shrunken Jensen Interceptor from the rear. It is aerodynamic in a way that has been forgotten, in that it cleaves the air sweetly, but without the modern emphasis on downforce, which gives it a light and delicate feel at speed. The steering talks away to you, rather than being smothered down into the road, it may sound daft but it gives the car a very period feel. In deference to its age, I don’t throw it about like I might the Cayman, instead I prefer to use it for long journeys where it can settle into a natural rhythm and just travel. This is an oft forgotten side of Porsche road cars, as folk so readily think of them as race cars. Truth is that the smaller less powerful cars make wonderful travelling companions for the road, another thing which links the 356 with the 924, as both feel they would travel to the ends of the earth without complaint. 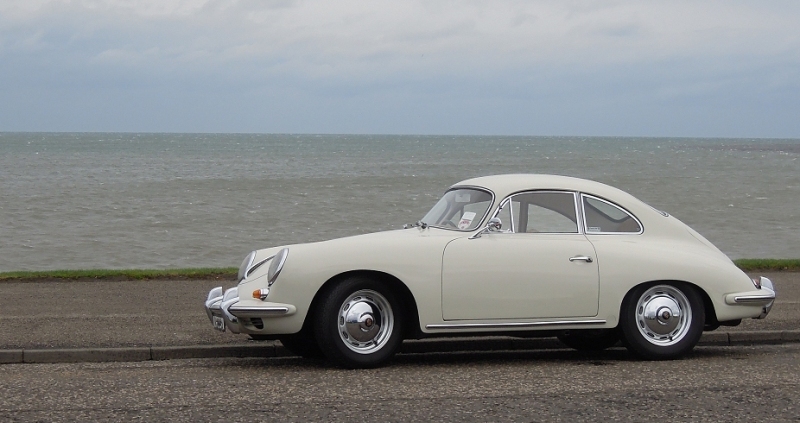 The Club’s 356 is a 1960 356B 1600 Coupe, which started life with the basic 60 bhp engine. Even in 1960, Porsche played the options game, and the car is quite basic, and therefore very much the entry level Porsche of its day. Ditto my 924, it is a simple 2.0 naturally aspirated 1981 car, with few luxuries, and it too was the entry level Porsche of the late 70’s and early 80’s. So in that respect they played the same role in the Porsche model range of the time, and both were comparatively expensive in their day. Recent history has treated them very differently however. I well remember as a student in the 70’s looking at a few tatty 356’s for sale for a few hundred pounds, and knocking them back as they didn’t seem good value. My word how times change! A well restored example is now going to set you back six figures. The 356 might be a revered classic now, but it was not always thus, often dismissed in the past as a jumped up Beetle. The truth is that the 356 was derived from the VW parts bin initially, but everything about it was rapidly modified in the best Porsche tradition of constant development. The same goes for the 924, originally a VW project designed by Porsche, it too drew heavily on the VW/Audi parts bin of the day, so history repeats itself. And can we please put the "van engine" myth to bed, the 924 engine uses a heavily modified Audi block (which can trace its origins back to Mercedes) which was also used in the LT van, but in a totally different format. Sadly the 924 languishes at the very bottom of the old Porsche desirability list, much misunderstood, as it spawned a huge range of cars that were to be the mainstay of the Porsche range throughout the 80’s. The transaxle cars kept the company afloat until the Boxster arrived on the market. Both the Club’s 356 and my 924 are both, in my humble opinion, great classic Porsche road cars which show what their basic models were all about in their day. Each one is a little slice of Porsche history, and I’d happily have both of them in my collection. But now we come to the nub of it …value … the elephant in the room! 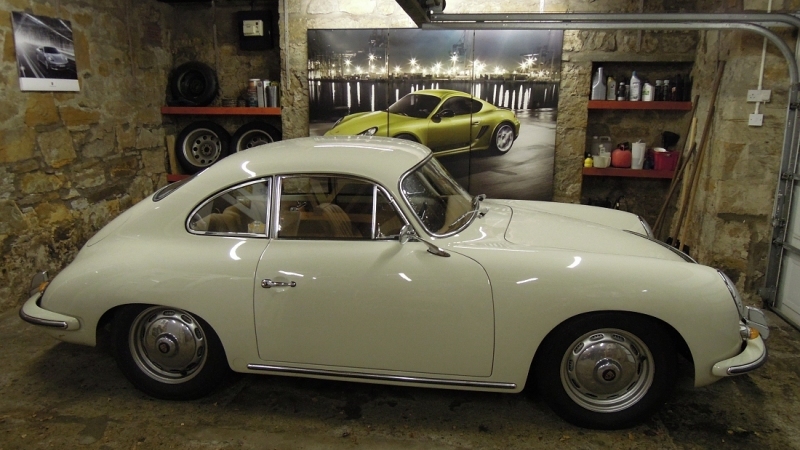 I don’t know what this particular 356 is worth, but looking at others for sale I wouldn’t be too surprised if it was easily £100,000. Yet even at my most optimistic, I think I’d struggle to sell my 924 for £5,000. 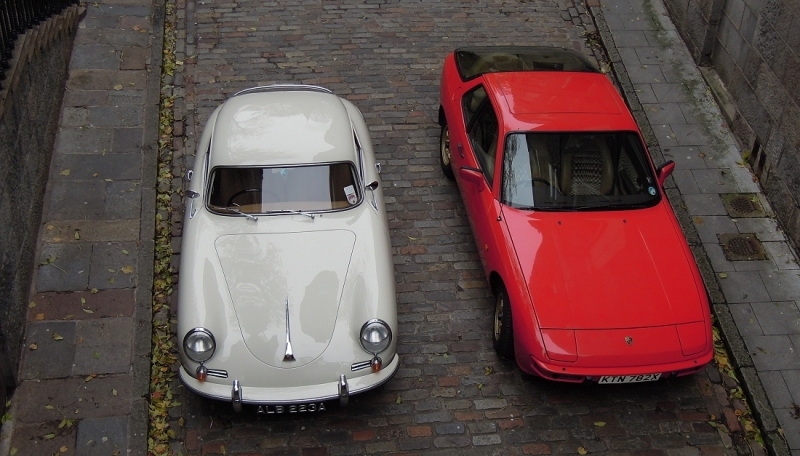 So … is the 356 better and more historic than my 924? Yes, of course it is. It is older, rarer, prettier, and more pertinent to the Porsche family history. But is it 20 times more valuable? No, patently it’s not. Objectively I simply cannot see why these two cars are such poles apart in value, as both are delightful pieces of history from our favourite car maker, and also still eminently useable classics on today’s roads. Subjectively though, it is a totally different matter. The classic car market has shifted in recent years and at the top end at least, we are no longer assessing these as simply used cars. There is now more of a parallel with the fine art market, where rarity, provenance, name and the like counts for more than the subject matter. Value becomes a function of what the market is willing to pay, and sadly too much fine art is now bought for investment value, to be kept in darkened vaults and admired only on a corporate spreadsheet. As an art lover I deplore this trend, and as a car lover it pains me to see the same thing creeping into the collector car market, but sadly it’s a fact of life. Bravo to the Porsche Club GB I say for not stashing the 356 in a vault, and I think that owning it and allowing members access to it may be one of the best things they are doing to promote Porsche history, and educate their members. I suggest the club buys a few more! So should you buy an old Porsche? Yes, I reckon. If you can find and afford a good original 356, you are very, very lucky, and I hope you enjoy what is a proper little diamond of a car. If you can’t afford one, you could do a lot worse than consider a 924, it is a much better car than you might realise, an overlooked piece of Porsche history. Don’t leave it too long either, as they won’t be around for pocket money prices much longer.